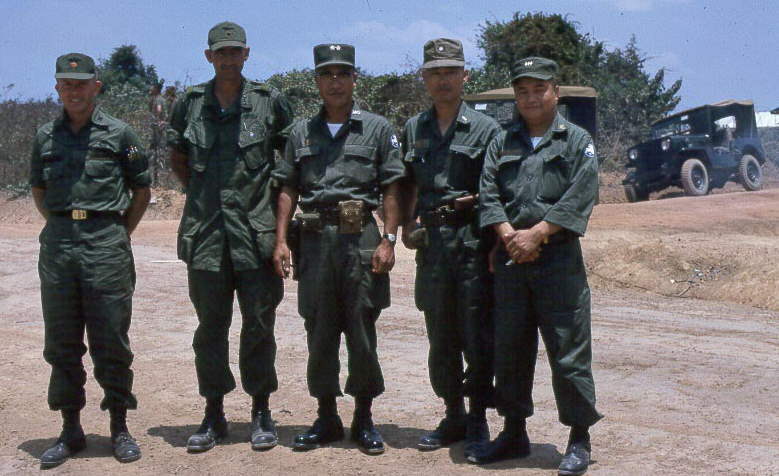 According to Derald, "The 174th was in Ninh Hoa supporting the 9th Korean White Horse Infantry Division in March 1967. At first there were a lot of problems with the newly arrived Korean units. The 174th assigned me as liaison officer to them. When I went to meet their people, the main officer I was to deal with (Maj. Jo?--not positive of spelling of name) was a Korean Aviator who I had known while in Korea. We didn't have any more problems after we started working together. One of our insertions was very successful. The Korean "tunnel rats" came up with a huge cache of weapons from a large tunnel complex. On our departure from Ninh Hoa, the Koreans sent us off with a ROK Marching Band!" Left-to-right: Major Henry (The Fying Dutchman) Schwarz; Major William Dalrymple; Major Jo (phonetic spelling), ROK 9th Division, and two unknown Korean officers.